The highest and most prestigious award given by the Alumni Association, the Alumni Medallion is presented to those who truly embody the best of William & Mary. These recipients will be honored during Charter Day weekend, on Feb. 11 at 10 a.m. in the Sadler Center’s Commonwealth Auditorium. One of Troy Keen’s ’96 favorite places on campus is Zable Stadium. After all, as an all-conference running back for the Tribe football team, he spent a lot of time there during his days as a student-athlete. 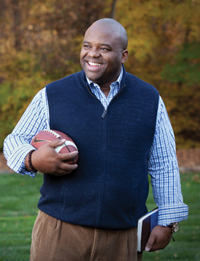 For Keen, the opportunity to even attend William & Mary, where he was a business major, president of Kappa Alpha Psi and involved in several campus organizations, was not simply due to his athletic ability and intellect, but because of the generosity of those who gave in support of athletic scholarships. After his time in Williamsburg, Keen moved to New York City to work in finance at Merrill Lynch before earning his MBA at the University of North Carolina-Chapel Hill. Keen moved to Charlotte, N.C., where he has continued his career in investment banking at Wachovia and Wells Fargo. Keen’s W&M involvement has remained uninterrupted since his days on campus. He has served as president of the Hulon Willis Association and the Charlotte Alumni Chapter, as a class ambassador, as well as on the board of directors of the Alumni Association and the Mason School of Business Foundation. In addition, Keen remains an ardent supporter of Tribe Athletics. Keen, an ordained Baptist minister, recently completed a master of divinity degree at Gordon-Conwell Theological Seminary in Charlotte and is in the process of forming an outreach ministry for men in his community. Still a fan of football and still working in finance, exercising the principles of his faith has now become his top priority. 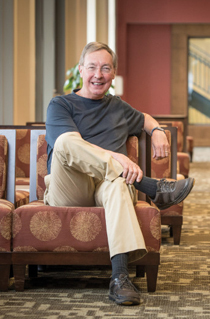 Jeff Trammell ’73 served as William & Mary Rector from 2011-13, making history as the first openly gay board chair of a major public university in this country. But he says his proudest moment was ringing the Wren Bell after presiding over his final Board of Visitors meeting, celebrating the passage of a promise to ensure the university’s future. Trammell’s dedication to improving affordability for students has ties to his own undergraduate years. His time with the Tribe began with a basketball scholarship. He served as captain of the men’s team and was selected as an all-conference honoree in 1972. Off the court, Trammell was a history major and president of Lambda Chi Alpha Fraternity. Post-graduation, Trammell busied himself right away by pursuing a law degree at Florida State University, but it didn’t take him long to start giving back to William & Mary. He has served on the Annual Giving Board of Directors, as a class ambassador and was chair of his 40th Reunion gift committee. 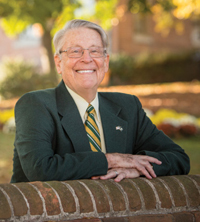 He was instrumental in the creation of the W&M Thomas Jefferson Program in Public Policy in 1987 and served as its founding chair. Today, Trammell is a member of the Monroe Commission that oversees Highland, home of W&M alumnus President James Monroe. He is a regional co-chair of the For the Bold campaign and chair of W&M’s Harriman Fellows, while running a consulting firm he founded in Washington, D.C., in 2001. In 2013, Washington and Williamsburg collided when retired U.S. Supreme Court Justice and former W&M Chancellor Sandra Day O’Connor married Trammell and his longtime partner at the Supreme Court building. It was a celebratory moment for Trammell’s dedication to the LGBT community and his relationship with the College. Ted Dintersmith’s ’74 25-year career in venture capital was all about innovation and entrepreneurs. Over the years, he saw that the people with the most impeccable academic track record often thrived when employed by large structured companies, but floundered when they left to work at more innovative startups. He also witnessed firsthand the impact innovation was having on the economy, including marginalizing routine jobs. Dintersmith began to sense that our education model was not preparing students for the creative world of innovation. In 2011, Dintersmith began focusing on the intersection of innovation and education, leading to his funding and producing the documentary “Most Likely to Succeed,” which premiered at the Sundance Film Festival in 2015. Since then, he’s traveled to schools across the nation —as well as the White House — to discuss the future of K-12 education. “I thought this trip would be mostly about my delivering a message to others. But as the trip unfolded, I saw teachers doing the most remarkable things with kids. I feel like these educators provided real clarity on what the future of our schools should be, in some ways what the future of our country could be.” Dintersmith is currently writing a new book, Education Across America, reporting on what he found in his travels. He previously co-authored a book with education expert Tony Wagner, Most Likely To Succeed: Preparing Our Kids for the Innovation Era, which was the basis for the film. 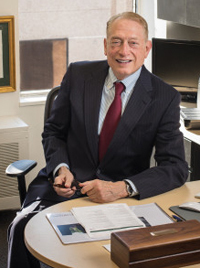 He is a former member of the Alumni Association Board of Directors and the Board of Visitors, and he served on the College of William & Mary Foundation Board of Trustees. He also helped found the project-based W&M Honors Fellowship program. He delivered the 2014 keynote address at the Opening Convocation ceremony. In 2012, he served as part of the U.S. delegation at the United Nations General Assembly, where he focused on global education and entrepreneurship. He supports a range of youth initiatives, including The Future Project, NewTech Network, Avanti Fellows and the African Leadership Academy. Fred Malvin ’55, M.S.T. ’58 likes to joke that he graduated from William & Mary in just two years. True, he attended the College from 1956-58, but before that, the undefeated high school wrestler attended Johns Hopkins University. Malvin went on to attend night school at the Norfolk Division of W&M (now Old Dominion University) before coming to the Williamsburg campus. After graduating with a degree in accounting, Malvin joined the United States Navy. He served for 22 years where he logged over 5,000 flight hours and served as commanding officer of two naval bases. While still in the Navy, Malvin earned a master’s in personnel management from George Washington University and a master’s in international relations from the Naval War College. After leaving the Navy in 1980, Malvin decided to put his William & Mary accounting degree to good use. After five years with Coopers and Lybrand, Malvin decided to start Malvin, Riggins & Co. with Joyce Riggins Schaffer ’82 in 1986. Since then, the company has expanded into Washington, D.C., North Carolina, Maryland and Pennsylvania and has been honored as one of Virginia’s top small businesses. Malvin says he attended W&M before he was mature enough to appreciate it. But now he’s making up for that. He and his wife, Donna, have not missed a football game in years. Malvin is a current board member of the Tribe Club, member of the Order of the White Jacket and the Quarterback Club. In the past, he has served on the Olde Guarde Council and as treasurer of the Muscarelle Museum of Art Foundation. Malvin is also involved in many community organizations, such as the Boys & Girls Club of the Virginia Peninsula, Friends of the Homeless, the Watermen’s Museum, St. Stephens Church and Dream Catchers.